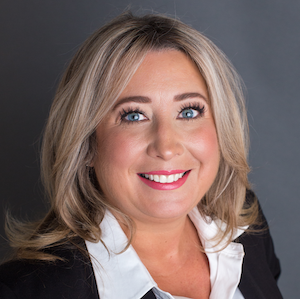 Kristina Davis started out in the defence industry over 20 years ago as a contractor with the Department of National Defence (DND). She officially started on a Wednesday, and by Friday of the same week, she was on a plane to Aviano, Italy. “I knew virtually nothing about the Royal Canadian Air Force, CF-18s, or the Canadian Armed Forces – so I asked questions. A lot of questions,” she recalled. From there, she worked for a government agency and then became a public servant. “I left government in 2015 and joined General Dynamics. I still ask a lot of questions,” said Davis. Kristina Davis is currently the Director of Marketing and Communications at General Dynamics Mission Systems – Canada. 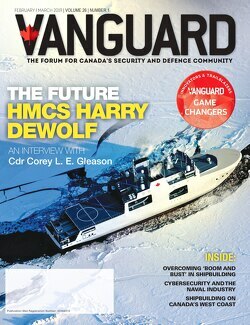 She was selected as a Vanguard Game Changer for the April/May 2019 issue. Here is the full interview with her. In 2007, I was in Afghanistan. It was Easter weekend, and I was back briefly at Kandahar Air Field (KAF). I actually don’t recall where I was coming from, but I was scheduled to visit the Provincial Reconstruction Team (PRT). KAF was in lockdown, and I remember being handed a piece of paper. It was a news release. Six soldiers had been killed. I folded it up and put the news release in my pocket. I had a decision to make: stay for the ramp ceremony or go to the PRT. There was no one I could call. No one I could ask. I went to the PRT. I felt it was important to tell the stories of the good work that continued. A few years ago, when I was packing my desk to move to General Dynamics, I found the still-folded news release. It was tucked in a file folder. To this day, it still feels like a surreal moment. One of my favourite “files” during my time as a public servant was Canada Army Run. I can’t really call it a “file” because it became my passion project. I knew nothing about running and – my first year with the event – knew little about the Army. But it became increasingly clear that this event had touched a nerve with Canadians. It truly created a connection that no one envisioned. As the event ballooned in size, I was given incredible latitude – and an incredible team – to tell its story. I think this was one of the first times in my career where my actions – and those of my team – had such a profound and direct impact on Canadians. While I always knew there was power in communications, it came to life for me during this event. Thousands and thousands of Canadians connected to their Army and my team facilitated that connection. My “moment” came one Sunday morning when a member of the team literally came running up to me. I knew something wonderful – or terrible – had happened. The Army Run was trending on Twitter. In fact, it was trending not just in Ottawa, but in Canada at number one. We didn’t stay there – I think Justin Bieber beat us out of the top spot – but we were there. I was reminded in that moment of the power of connection and the power of a story: of our soldiers, of Afghanistan, of those killed, of those forever changed, of Soldier On and Support our Troops. Communications is about that connection and telling stories. I try to remember that it’s really that simple on the days that it feels anything but. I’m still all about connection, but today I’m fired up about seeing more women working in defence and security. At General Dynamics, we recently launched our Women’s Leadership Series bringing together both men and women to have candid conversations around barriers – real and perceived. We’re also the first patron sponsors of Women in Defence and Security (WiDS), an organization that champions women across our community. I know I’ve been lucky. I’ve had opportunities that brought me to Afghanistan, the Golan Heights, Moldova and India. I’ve taught on NATO courses and on Partnership for Peace exercises. I’ve been the only woman in the room. I always felt heard. And that’s my wish for women considering a career in defence and security: that they feel heard, accepted and empowered. I never started out thinking I’d work in this industry, but I can’t imagine working anywhere else. It’s only through diversity and inclusion that our field will continue to flourish. My Dad always said: “Everyone puts their pants on one leg at a time.” I’m not sure when I truly understood what he meant. We really are all the same. Things scare us. Things thrill us. The “things” might be different, but we’re all human. As I’ve grown as a leader, I’ve become more empathetic, but it wasn’t always that way. I had to find my own leadership path. I was lucky to have some excellent role models along the way – leaders who embodied the values that spoke to me. Trust your team. Empower them. Support them. Set them up for success. Care about them and their wellbeing. And then let them do their thing. Literally get out of their way, champion their success, and if there are barriers to that success, remove them. One of the best courses I have ever taken was Telfer’s Public Service Leader’s Program. There, I developed my leadership credo. I use it to this day: “Communications champion who leads by example, creates great teams, inspires others, and removes barriers to success.” If I’m not doing these things, then I’m not serving my team. From the most senior to the most junior – they all put on their pants in the morning one leg at a time. I get up early. My husband, a Chief Warrant Officer in the Army, will disagree, but for the rest of the population, I do get up early. It gives me the time to collect my thoughts, voraciously read Twitter, and prepare for the day. I hate being rushed in the morning, and that “me” time is really important. I’ve also become accustomed to working across time zones, so getting up early helps me tackle emails that might have come in overnight. This is a habit I developed while working on the Afghanistan Task Force. I want to begin my day having a sense of what’s going on in the world and what might await me once I arrive at the office. I’m a heavy consumer of information. From blogs to Instagram to Twitter – I love information. I think that some of the most cutting-edge communications are actually coming from influencers. This may not be a popular opinion, but it’s hard to discount the accounts that have literally hundreds of thousands of engaged followers. They’re changing the marketing and communications landscape with a very innovative mindset. And maybe, just maybe, that guy or gal in their living room with over 500,000 followers, chatting about makeup is onto something. From a marketing and communications perspective, we’re taking full advantage of the power of social media. From Twitter to Facebook to LinkedIn, we’re telling the story of our organization and our employees. And while many other industries have had social media presences for years, the defence and security industry has been slow to embrace these platforms due largely to the nature of the business we’re in. I do, though, see that changing. We’re profiling our employees during National Engineering Month. We’re highlighting the work we do for our customers. And we’re telling the stories of what matters to us. From FIRST Robotics to Team Rubicon and the countless hours our employees donate in volunteer time, we’re sharing these stories. Employees feel pride. Potential employees get to know us just a little bit better. Our brand simply gets stronger as we engage with our online community. It’s changed the way we think about marketing and communications. From a marketing and communications perspective, it’s often the “what” of what we do. Sometimes there are simply things we can’t talk about, and that’s not going to change. As a result, we need strategies that allow us to continue to tell our story, without giving away the “secret sauce.” This is where a communications strategy becomes so important, as well as the support of the senior leadership team. We are supported – and trusted – to tell the General Dynamics story authentically. Innovation is simply part of who we are at General Dynamics, and it is championed from the top. From a marketing and communications perspective, I’m supported to introduce new tools, to introduce new engagement initiatives, and to help foster a culture of innovation. Network, network, and network some more. Talk about leadership, talk about your success, talk about your failures, learn about your industry, learn about another industry. Cultivating relationships can sustain you in the good times and the bad. And having an active network allows you to pick up the phone and ask: “What would you do?” I wish that my younger self had done more networking.